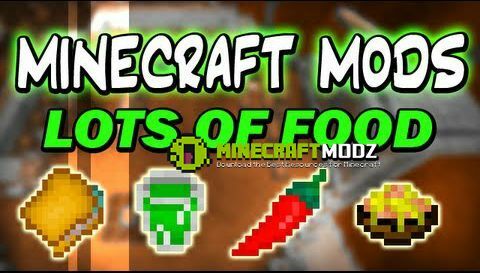 Lots of Food Mod adds more and more food, its french name is “Plus d’aliments”. 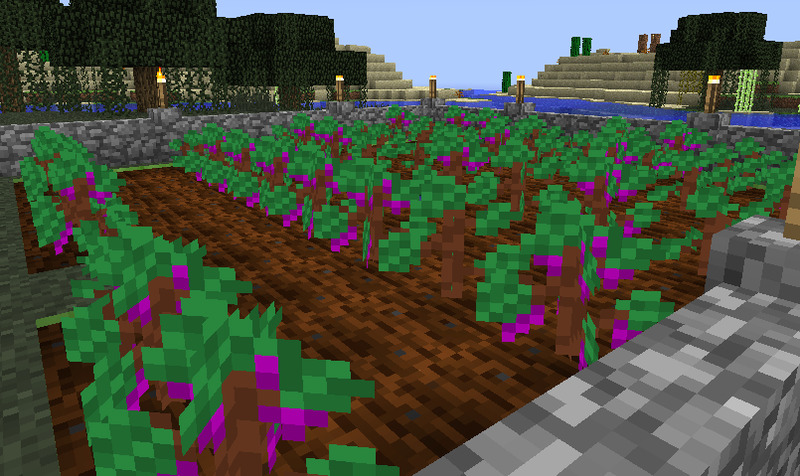 It also allows you to farm red pepper and vine. They allow you to farm pepper, that grows on grass. It grows slower than cocoa but faster than wheat. It doesn’t need any water to grow, and bonemeal make it grow instantly. When the peppers are mature, break it and you will earn 1, 2 or 3 peppers. After that, you can craft pepper seeds with pepper. Eating a pepper gives you 2 food points, but you burn during few seconds, unless you’re in the water or in the rain. It gives you back 3 food points. It gives you back 6 food points and you get back the bowl when you eat it. It gives you back 3 food points and it’s useful to make a chocolate cake, or to make hot chocolate. It gives you back 5 food points. It perfoms like the vanilla cake, put it somewhere and use left or right click to eat a piece. Each piece gives you back 1 food point. You can obtain it puting a bowl of chocolate in your furnace. It gives you back 4 food points. You can’t stack it, but you get back the bowl when you drink it. It gives you back 2 food points. It can be useful to store chocolate, because you can reverse this craft (puting a block in the crafting grid gives you 3 chocolates). They perform like the vanilla fences. It gives you back half a food point, but it’s useful to make other foods. You can stack it by 16. It gives you back 6 food points. It perfoms like the vanilla cake, put it somewhere and use left or right click to eat a piece. Each piece gives you back 2 food points. The mobs who walk on it are slowed down (like the soulsand) and it’s useful to make caramel ice creams. It can also be useful to store caramel, because you can reverse this craft. They can be useful to store sugar, because you can reverse this craft. It gives you back 1 food point. You can stack it by 16. It gives you back 4 food points. You can’t stack it, but you get back the bowl when you eat it. It gives you back 7 food points. You can’t stack it, but you get back the bowl when you eat it. It gives you back 6 food points. You can’t stack it, but you get back the bowl when you eat it. It gives you back 3 food points. You can’t stack it, but you get back the bowl when you drink it. You can’t stack it, but you get back the bowl when you drink it. It needs seaweed, that you can find in oceans, lakes and rivers. It gives you back 2 food points. You can farm seaweed underwater. It gives you back 2 food points, like rotten flesh, but you can’t poison yourself eating it. 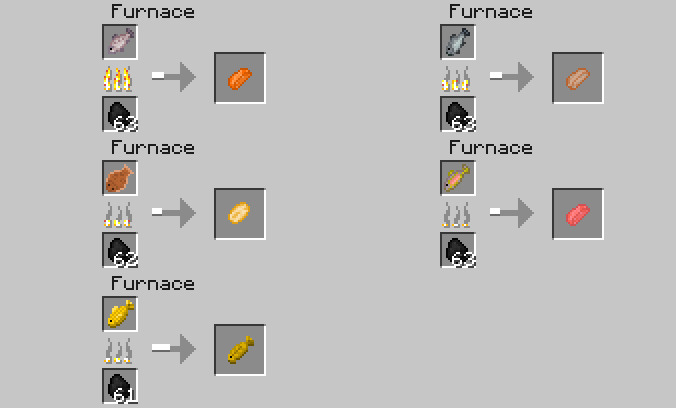 You obtain a cheese puting a bucket of milk in a furnace. It gives you back 2 food points. It gives you back 1.5 food points. , and are useful to make sandwiches. Cheese and ham sandwiches give you back 5 food points. Chicken and fish sandwiches give you back 6 food points. You can get grape when you kill a zombie (like carrots and potatoes). A grape will give you back 2 food points. You can also plant it on farmland, and harvest it when the vine holds grape. You will find coconut palms on beaches. Breaking a coconut block will drop a coconut item, and sometimes a coconut palm sapling (you can plant it on sand). You can throw a coconut on a block or on a mob (that will hurt him). On impact, the coconut will break and you’ll get its 2 halfs, wich can be eaten to give you back 1 food point. It’s useful to make juices. They give you back 2,5 food points. You can’t stack them, but you get back the glass when you drink them. You can get wine and cider from grape and apple juice. They give you back 2.5 food and life points. In return, you will be confused during 30 seconds. You can’t stack them, but you get back the glass when you drink them. It does not give you back food points, but it cleans all potions effects, like the milk. You can’t stack it, but you get back the glass when you drink it. It gives you back 4 food points. You can’t stack it, but you get back the glass when you drink it. You can’t stack them, but you get back the bowl when you eat them. Chocolate and melon ice creams give you back 4 food points. Apple, grape and coconut ice creams give you back 3 food points. Caramel ice cream give you back 5 food points. A pancake gives you back 1 food point. Sugar pancakes give you back 1.5 food points. Caramel and cheese pancakes give you back 2 food points. Chocolate pancakes give you back 2.5 food points. You may get these fishes with a fishing rod : salmons, hakes, soles, trouts and golden fishes (very rare !). Salmon and hake give you back 1.5 food points when raw, and 3 food points when cooked. 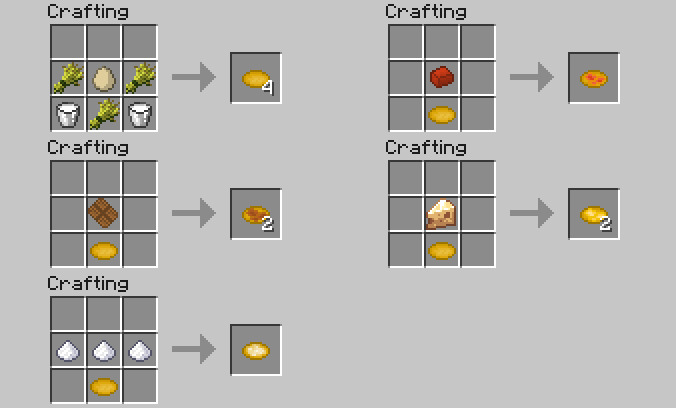 Trouts and soles give you back 1 food point when raw, and 2.5 food points when cooked. Golden fish give you back all your food points, and even all your life if cooked. You can use these fishes with ocelots/cats, except the golden fish. These houses, very rares, sometimes appear in the world. They’re made of caramel, sugar and chocolate. 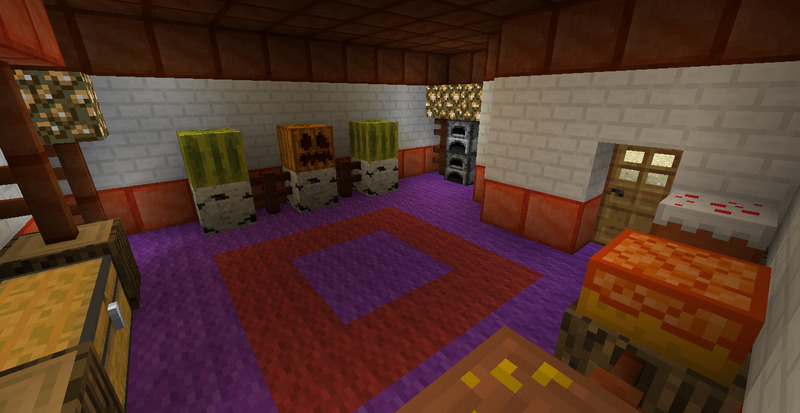 In their chests, you can get food and various ingredients.